A few months ago, the 5 year old 17 inch Norcent LCD in my home started acting strangely. Pushing the power button will cause the monitor to light up for a split second then it’ll go dim. In the first few days, the monitor will eventually stay lit after turning it on or off many times and it would work for the day, but we had repeat the process the next day and things progressively got worse. I did some research online, and in particular I found this very handy article. The symptoms or my monitor are consistent with a back light problem, and this seems to be common problem with LCD monitors. I confirmed the problem by shining a light onto the monitor after it went dark. The monitor was displaying the signal, but there was no back light. The cause of the problem can be a faulty back light bulb or inverter board, and if it’s the inverter board the likely cause is bad capacitor(s). Given that our LCD was 5 years old and made by a bottom-tier manufacturer, I wouldn’t be surprised if the problem was just some bad capacitors so I decided to try and repair the monitor. After all, I am an electrical engineering student, and although electronics is not my specialty, I have soldered before and this sounded like an easy repair. My family bought a new monitor to use, but we kept the old monitor around until I had time to deal with it. The old Norcent LM730, ready to be taken apart. These four screws secures the stand to the monitor. It took me 40 minutes to figure out that they are there. 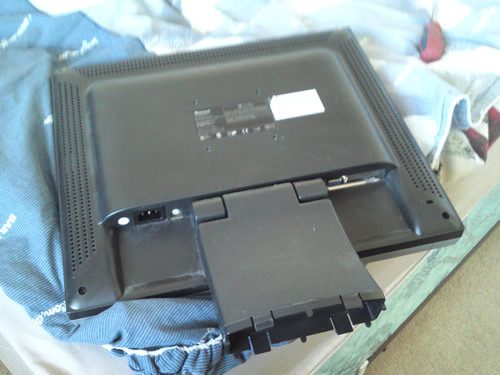 To repair a LCD monitor, first your have to open it up by removing the stand and back cover. It’s recommended to do the dis-assembly on a soft surface so that there’s less chance of damaging the screen. The back cover is often clipped into the front with plastic clips and secured using screws. The Norcent I was dealing with had four screws on the corners that was visible. I removed the four screws and tried to pry the monitor open with a flat blade screw driver (not recommended if you don’t want to scratch the outer casing, but I didn’t care since this was an old monitor) and spent 40 minutes at it, but something was holding down the back cover near the bottom. Eventually, I discovered that the stand was also fastened into the LCD by four screws, but these screws are hidden underneath two plastic covers that had to be removed. I was feeling pretty stupid at the moment, but I continued on, removed the four screws and took off the back cover. The lesson here is that to make sure you remove all the screws before trying to pry open the back cover. After much effort, I finally popped off the back cover to reveal the protective casing and all the goodies inside. Removing the back cover reveals a protective metal casing sitting over the circuit boards of the LCD. 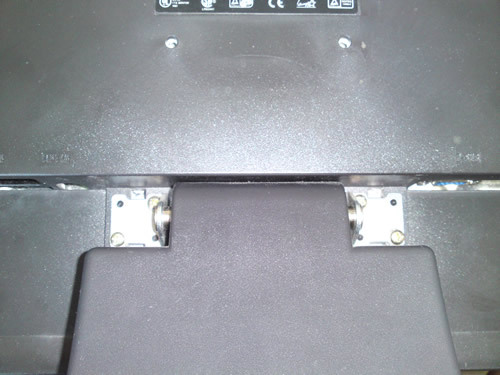 For my monitor, the protective casing can be removed by releasing two screws on the left and then sliding the cover to the right. However, removing the casing proved to be more complicated than that as two connectors when through the casing at the bottom. The wider connectors is for the front panel controls, while the narrow black connector is for the speakers. The wide connector was relatively easy to remove, by the speaker connector took a lot of fidgeting mainly because the socket on the circuit board was loose, and therefore I dare not pull too hard on it. It took me about 10 minutes to unplug the cables and remove the casing. The Power/Inverter board removed from the rest of the monitor. With the protective casing gone, I got a good look at the two main circuit boards of the monitor. 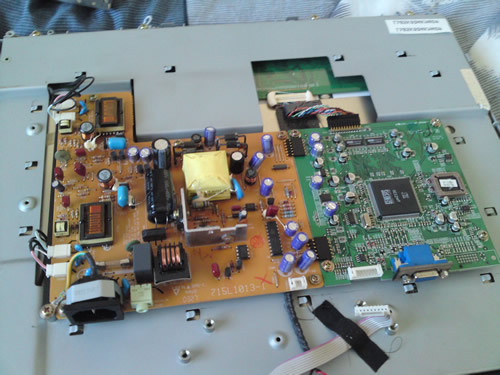 The larger yellow board on the left is the power supply and back light inverter board, and the green board on the right is the Analog to Digital converter. At this point, it was time to inspect the circuit board and components for any abnormalities. For radial electrolytic capacitors (the tall cylindrical objects in the picture), the tops should be flat and nothing should be leaking out of the capacitors. From my inspection, I found one capacitor on the power/inverter board that had a bulging top, and I assumed that was the troublemaker as everything else looks fine. Found the culprit. The bad capacitor is the one with the black marking on top. The bad capacitor was a 16V 1000uF radial capacitor. If you don’t have any capacitors on hand, you can buy some from local electronic stores (those that cater to hobbyists) or from online sources. Luckily for me, I actually had some capacitors left over from my undergrad electronic labs, and in my collection was a 1000uF capacitor rated at 50V. The voltage rating of a capacitor is the maximum voltage the capacitor can be used under, so in many cases it’s okay to replace a capacitor with another one with a higher voltage rating, provided they have the same capacitance. 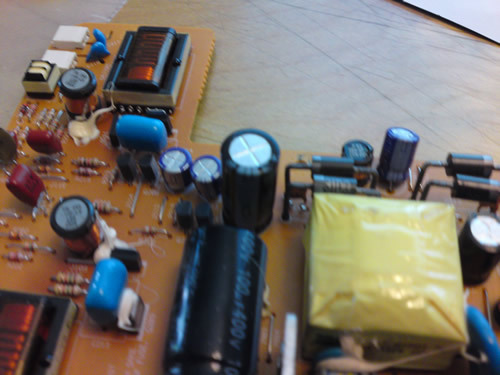 The 50V replacement capacitor was a fair bit taller than the broken 16V, but it looked like it would still fit under the protective cover, and the good thing was that the two capacitor had the same spacing between their terminals. That means I only had to straighten the wires on the replacement and it should plug right back in. To remove the bad capacitor, first I had to remove the circuit board so I can access its underside. 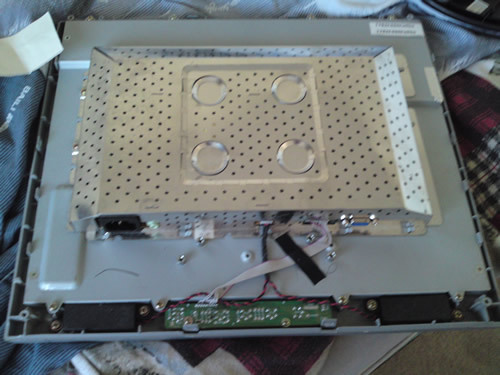 The power/inverter board was fastened to the front monitor by several screws which were easily removed. There were also a couple of connectors to the back light that have to be disconnected, and it’s important to note down the orientation and location of the connectors. It’s also important to keep track of all the screws that have been removed. At that moment, I suddenly realized that I didn’t have any soldering tools at home, so I went to a local hardware store and bought a $10 soldering iron and $4 worth of rosin core thin solder. A $10 soldering iron probably won’t be too reliable, but I didn’t want to spend too much money on this repair. The soldering iron worked well enough though, although it does take a bit of time to heat up. 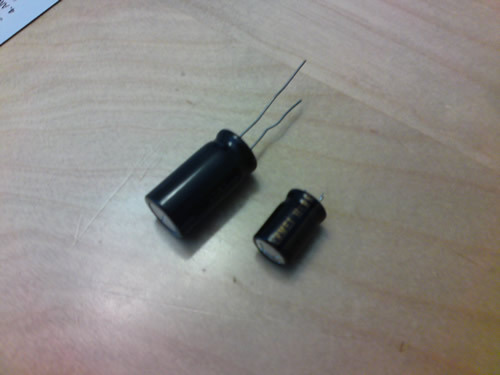 The two capacitors: the smaller one on the right is the bad one, while the larger one on the left is the replacement. Back to the task at hand, removing the bad capacitor is a pretty straight forward job. All I had to do is used the soldering iron to heat up the solder on the underside of the board and wiggle the bad capacitor out on the topside. This is much easier to do if you have something to hold the circuit board in a vertical position. Since this particular capacitor wasn’t located closely to any other component, I didn’t even need to use any solder sucker or solder wick. After the bad capacitor was removed, I put in the replacement which slid right in as the two capacitors have the same distance between terminals. The board clearly indicates which side is positive and which side is negative, but it’s always important remember which way the capacitor should go in as electrolytic capacitors can blow up if inserted in the wrong direction. The striped side of the capacitor is always the negative terminal. Resoldering the capacitor was pretty easy as well; I just melted a dab of solder onto each wire and let it form the bond with the board. I then snipped off the extra wire from the terminals of the replacement capacitor and that’s all for the soldering. 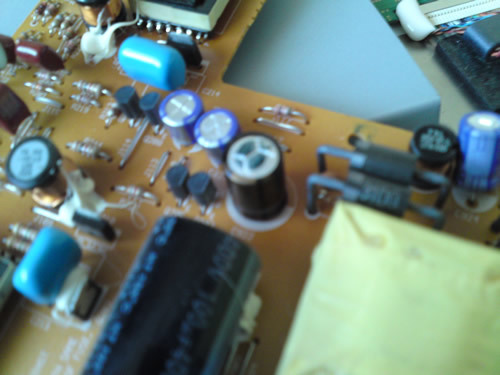 The replacement capacitor soldered back on to the board. The repair board mounted back into the monitor. All that was left to do now was to reassemble the monitor and test it. Having learned from my mistakes during dis-assembly, I took much less time to reassemble the monitor. All I had to do now is to test if my hard work had actually fixed problem. First I just plugged the monitor into the wall plug and turned it on to see if smoke will come out. Thankfully, nothing of the sort happened, and the “no signal” message displayed on the screen and it was clear that the back light was working. I then connected the monitor to my computer, and the screen displayed without any problems. The monitor was fine once again and all it took was $15 worth of equipment and a bit of elbow grease. The old Norcent LM730 is displaying once again! 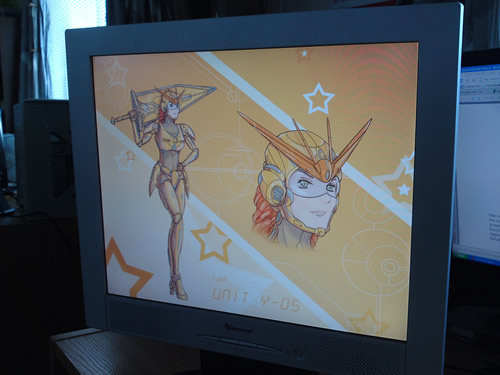 In case you are wondering, I drew the picture displayed on the monitor. Looking back at the process, taking apart the monitor was definitely the hardest part of the job. That was mostly because I was unfamiliar with the monitor’s construction and I was also being dumb. The soldering part was quite easy by comparison. Despite having shaky hands, I managed to complete the job without any problems. Then again, I did spend a couple months doing hardware testing in a co-op job and the kind of soldering I had to do there was much more difficult than this job (I got my work done, but killed a lot of test boards in the process ). 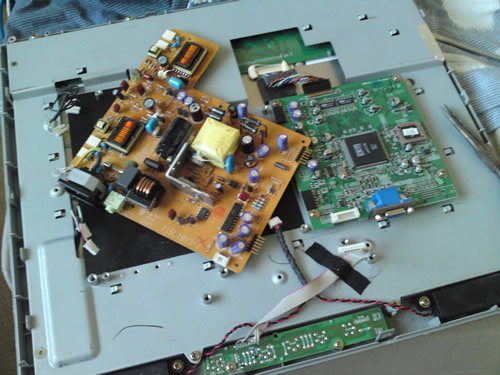 Overall, replacing a capacitor in a LCD monitor is pretty simple repair that almost anybody can do with a little bit of research and equipment. I hope this post will be some help to people facing a similar problem. Thanks for reading. Repairing Monitors or electronic devices is not easy!! do you think that is a matter of changing a capacitor?. Of course not all electronic problems can be solved by replacing capacitors, but it just happens that this was the fix needed for the particular monitor. If it happened to be something more complicated and beyond my abilities I wouldn’t have bothered. Thank you for posting this information. My HP w2207h went bad last week, I tried this repair and it worked very well. The monitor works like new. Congrats on obtaining your Ph.D. It is quite an accomplishment.